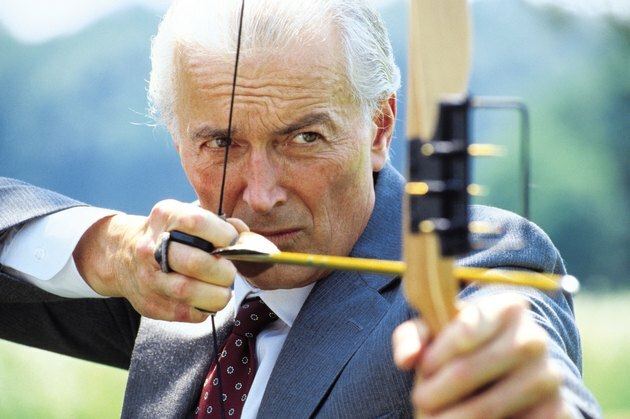 Archery dates back hundreds of years when bows were used during battle. Some of the first bows were developed by the Egyptians and were made from wood, animal horn, sinew and glue. Since that early wooden bow, recurve bows, longbows and other traditional bows have been made from various types of wood. While the first wooden archery bows were made from yew, numerous types of wood have been used through the years. Among these wood types are hickory, mulberry, walnut, ash, cherry and hickory along with exotic woods such as basswood, yucca, osage orange, lemonwood, blackwood and ironwood. Despite the long list of potential wood for an archery bow, maple is the most common core wood, especially for glass-faced and backed bows. The overall design and construction of the archery bow may affect the selection of the wood. For example, early archery bows were made from yew and combined with animal horn, sinew and glue for the other parts of the bow. Composite wooden bows–made with several different materials–can actually use different wood for different parts of the bow such as the riser, limbs and grip. Making archery bows requires several characteristics for the best performance. Wood provides these physical characteristics and also provides several other benefits. Overall, the wood must be flexible enough to handle the bending and stress applied during every shot. Maple, for example, can be consistently found in good, clear grades and is a hard, dense wood with a straight grain. Similarly, the other types of wood provide a light, cheap wood that can be cut and handled during the bow manufacturing process. Wood offers numerous benefits for archery bows, but they still have several drawbacks compared with other synthetic or aluminum materials. Wood, for example, can warp or change shape as a result of temperature or environmental changes ). Another drawback to wooden archery bows is the inability to replace limbs if it breaks. If you are considering making your own wooden bow, choose maple as it is the easiest to work with because of the absence of knots or twisty grain patterns.